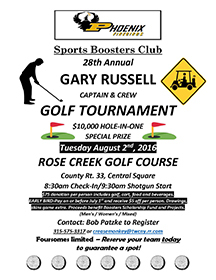 PHOENIX – The Phoenix Firebirds Sports Boosters Club will host its 28th annual Gary Russell captain and crew golf tournament on Aug. 2 at Rose Creek Golf Course, 344County Route 33, Central Square. The event will begin that day with an 8:30 a.m. check-in and a 9:30 a.m. shotgun start. Each player’s $75 donation includes golf, cart, food and beverages. Throughout the tournament there will be drawings and special prizes, including a $10,000 hole-in-one prize. Men’s, women’s and mixed teams are encouraged to enter. Foursomes are limited, so reserve your team today to guarantee a spot. Proceeds will benefit the club’s projects and scholarship fund.